About 60km downstream on the Drava River from Maribor, past the ancient Roman village of Ptuj and the border town of Ormoz, sits Jeruzalem. As legend has it, this small circular cluster of incredibly steep ridges, known for growing some of the finest wine in Slovenia, was settled by Crusaders returning to Europe from the Holy Lands, thus the name. And along these steep pitches are dozens of small, family-run vineyards and wine producers, all flanked by rows of tidy, shimmering green vines swaying in the mountain breeze. Connecting the farm houses and acres of grapes vines are kilometer after kilometer of twisting roadways, quiet except for the occasional tractor or local farm truck ambling past, providing one of the most rewarding and picturesque bicycle travel destinations in Slovenia. Leaving Maribor mid-morning with lightly loaded bikes, we cruised east along the flat Drava River Cycle route until early afternoon when we turned north from Ormoz. As the terrain changed quickly from the almost completely flat riverside cycling to short, incredibly steep hillside, so did our delight. 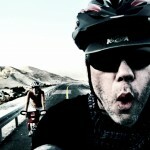 Pedaling further into the vineyards and winding roads both Carolyn and I are stricken with perma-grin. 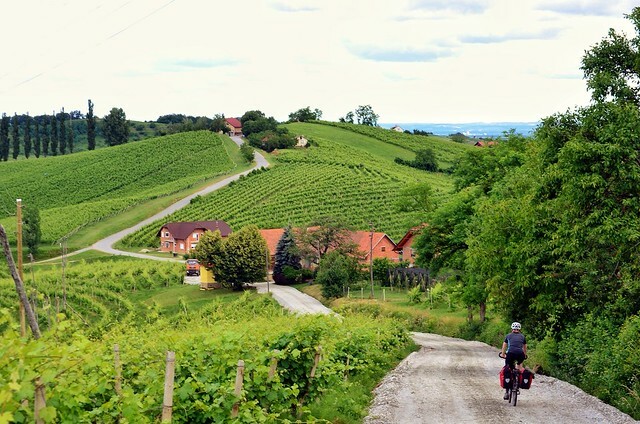 In almost any land, vineyards and wine growing regions make for some pretty sweet bicycle travel. Here in Jeruzalem, the standard is ratcheted up a notch or two. The quiet roads wind their way to the next ridge, each farm seems is tidier and greener than the last. As we pedal past, the locals invariable smile and greet us with Dober Dan, (Slovenian for “good day”). Our smiles grow larger by the minute. 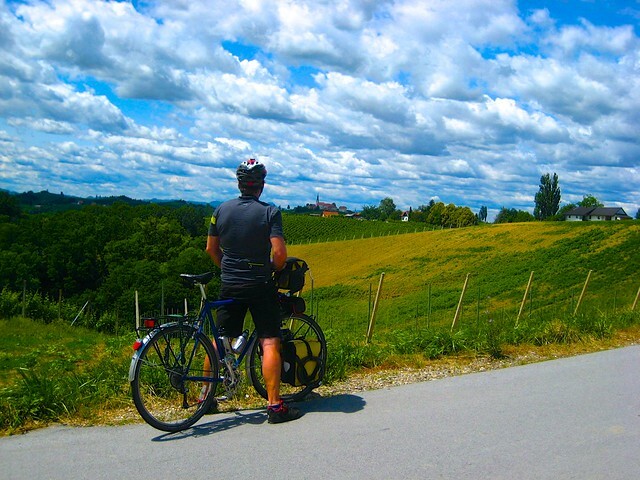 At the top of each ridge we are rewarded with stunning views and more twisting Slovenian roadways upon which to cycle. It would be easy to get lost up here ( and we do…a bit), as most of the roads aren’t marked with names, but rather sign posts to the next winery. 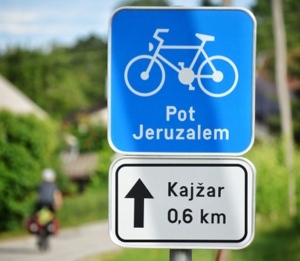 As with most places in this tiny country, if there is good cycling, which Jeruzalem has plenty of, there will be at least a few signs guiding cyclists in the right direction. Shortly after ascending the second ridge, we begin following the “Pot Jerusalem” ( “Pot” being Slovene for “trail”). The Pot Jerusalem is a roughly 25km loop, guiding cyclists around a circuit of ridges, linking some of the more popular vineyards, tourist farms, wineries, churches, and of course the village of Jeruzalem, proper. Although short in distance, the “Pot“, as we named it, proves to be challenging yet rewarding, to say the least. One of the complementary aspects of vineyards, is the “Tourist Farm”, similar in form to the Gasthof, but oh, so Slovenian in function. 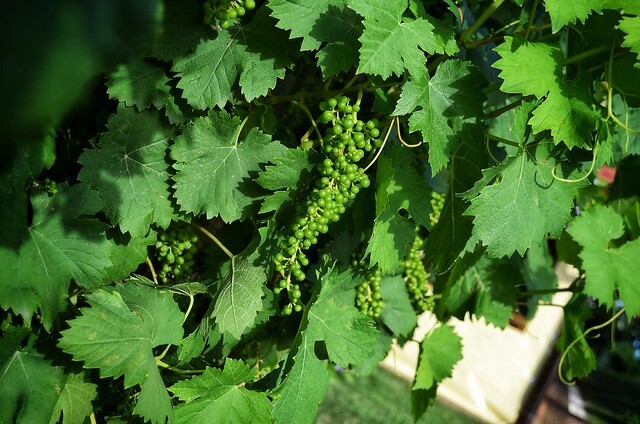 Comfy beds, home-cooked meals fresh from the garden, and of course locally produced wine are all available at the Tourist Farm. Here in Jeruzalem many are attached to their own vineyard. Our night’s accommodation has been arranged in advance, something we don’t always do. We are lodging at Vineyard Hlebec for the night. 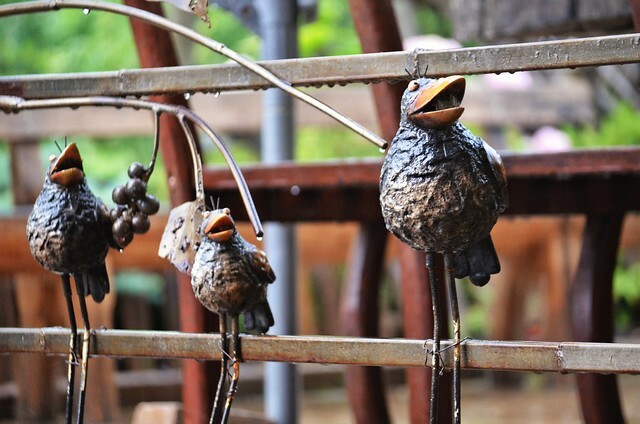 A funky, artsy Tourist Farm and Winery located just off the “Pot” in the nearby settlement of Kog. 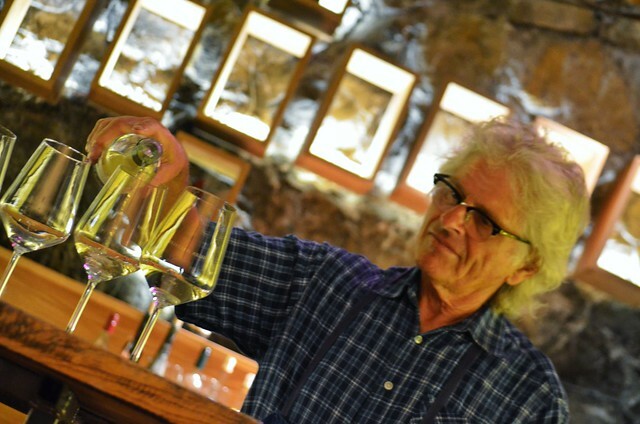 As guests of Milan and Verica Hlebec, one of Slovenia’s most well-known and colorful winemakers, we spend our first 10 minutes or so following Milan from room to room, as he uncovers unlabeled, dusty bottles containing mysterious grape-based liquids. Eventually Milan escorts us to his ’tasting room.’ A modern, basement laboratory stocked with row upon row of bottles, a stylized work bench of sorts and funky lighting to set the mood. In this setting Milan appears to be at home, his untamed gray hair and horn rim glasses give him a bit of a professorial look as he describes each bottle in great detail. After a thorough inspection of the wares, Verica has prepared a hearty, county-style vegetarian meal for us on the front porch of the main house. Carolyn and I gobble down scoops of buttery potatoes, creamed zucchini, bread and salad soaked in locally-grown pumpkin seed oil. The meal and our hosts are the perfect complement to a great day on the bike. After a night’s rest in the farm house under comfortable, clean sheets and another hearty meal in the morning, we say goodbye to Hlebec and continue to cycle on around the “Pot”, backtracking a few kilometers to link up with a section we hadn’t seen the day before. On the opposite side of the loop sits the village of Jeruzalem itself along a high ridge complete with a hotel, another stunning church and more wonderful wineries. Pedaling up and down, stopping to snap pictures and gaze out at the almost storybook landscape, we barely cover 12km by lunch. Stopping at Taverna Gostilna for lunch we look down the ridge at Malek, another famous, albeit much larger winery and the small village-come-winery/tourist farm: Svetinje. 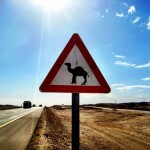 Stopping in these places is a must for anyone cycling through the Jeruzalem area. While we were in Maribor, everyone we met told us about Jeruzalem. Asking us if we had been there yet, or if we planned to go cycling there during our visit. For a brief period before arriving to this vine-covered shangri-la, we halfway expected it to be overrun with tourists, considering the amount of local coverage we were hearing. Actually, it was quite the opposite. The one thing that was missing were the crushing hordes of tourists. This translated into bicycling on empty, twisting vineyard roads with great wine and charming homespun accommodations at affordable prices. 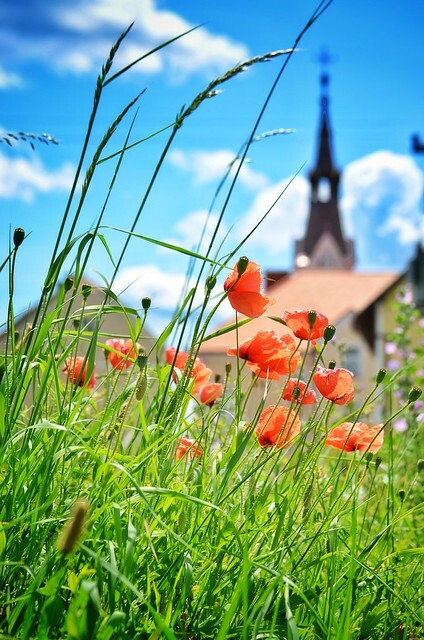 Combine this with the easy bicycle access from Maribor and some of the most charming hosts one could meet anywhere and you have an almost perfect bicycle tourism destination. 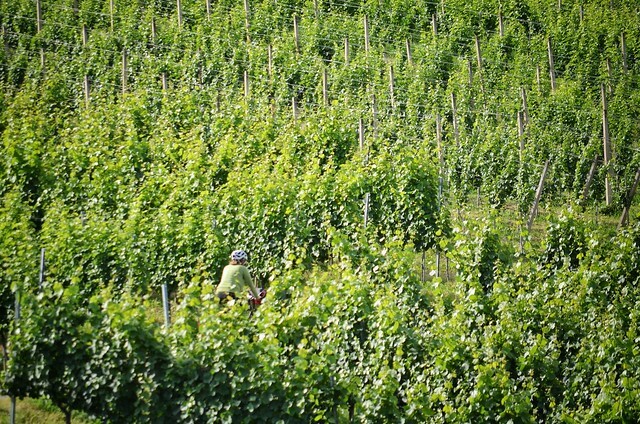 One thing we would like to see is these Vineyards/Tourist Farms making a more outward effort to attract bicycle tourists. As we have said before, using simple things to encourage bicycle travel is the most effective. Simply telling cyclists that you want us to stop is the easiest and most effective technique. Messages to bike tourists on the roadside signs pointing to the wineries and tourist farms are the perfect place to do this. Some other thoughts are: special offers to overnight bicycle tourists or smaller, cyclist-sized wine tastings to people travelling by bicycle or simply posting a sign out front that says “cyclists welcome here” can go a long way to enticing passing bicycle travelers to stop into a vineyard or tourist farm. Working together as a community to gain the attention of bicyclists would only serve to benefit the area as whole. 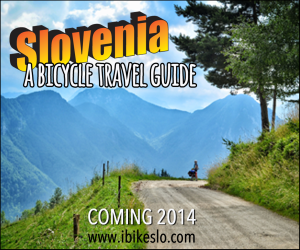 We hope to see it grow, especially as bicycle travel is steadily growing across Slovenia.